In 2011 we sailed Oasis of the Seas. This amazing Royal Caribbean mega ship offers something for everyone! I was reluctant to cruise on a ship so large, but the advantage of so many activities and venues is that it feels surprisingly uncrowded! Also, due to the way the ship was designed with certain "neighborhoods and an open interior, I found it much easier to navigate than much smaller ships. The open concept allows you to easily see into other parts of the ship and know which way is forward and which is aft. Although the distances between venues are greater on this ship, it's much easier to find your way around. The only disadvantage of such a large ship is that it cannot tuck into the small ports and off the beaten path locations. One of the things that delighted me about Oasis was the innovative design of the ship to manage the amount of people on board. Unfortunately, Oasis underwent a recent "refurbishment" and as always, that includes ways for the ship to be restructured to include more revenue enhancing areas (added fee restaurants and extra cabins) These changes can have a major effect on the way the original spaces were designed to function. We enjoyed this ship as a floating wonder to enjoy while on board and expected to stick to well worn tourist paths while in port. A couple of notes: These are all our own photos, most of the panoramas are Kathy's and not nearly as good as Jeff's photos. Some of the venues may have changed with recent ship upgrades. We did not receive any compensation or free travel; these are our own impressions. In 2009 we were aboard the Navigator of the Seas when Oasis made her inaugural voyage out of Fort Lauderdale. 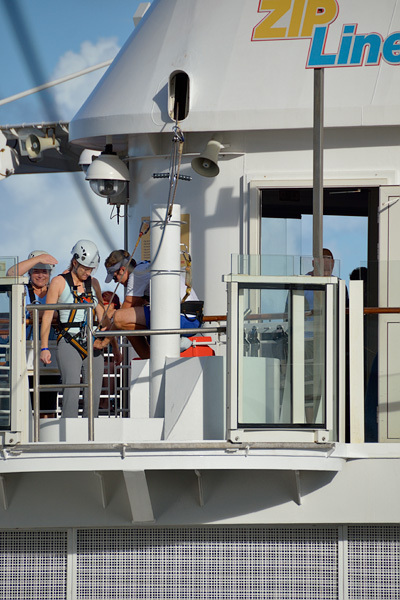 When the captain announced she was alongside, the spa crew, the waiters, even the officers came out to the rail to see her sailing beside us. There was nothing like this on the seas, it was a complete innovation for cruising and I was captivated by this new ship, but a little fearful about her size. 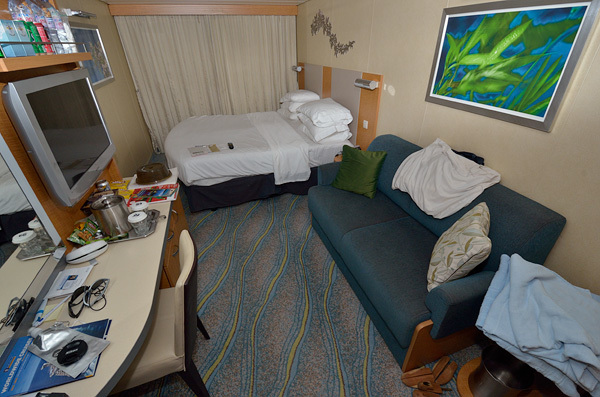 The following year, I booked a voyage on Oasis of the Seas and was pleasantly surprised! I'm embarrassed to admit, we did not make it to the fitness room even once during this cruise! As the Rising Tide Bar elevates to central park, a dancing fountain activates below it. This top deck with loungers (deck 11) was a favorite place to relax, and see shows from above the aqua theater and I usually had the whole place to myself most of the time. Being underutilized, that was one of the spaces recently turned into a luxury suite, similar to the 2 decks below it, and is no longer open to the public. Sorry for not having any photos of the kids zone...we didn't have any use for these spaces and taking photos there is difficult! Unfortunately, we did not get photos of these areas. However, we did take photos of these locations on Oasis's sister ship, Allure, on a later cruise, reviews are linked below.